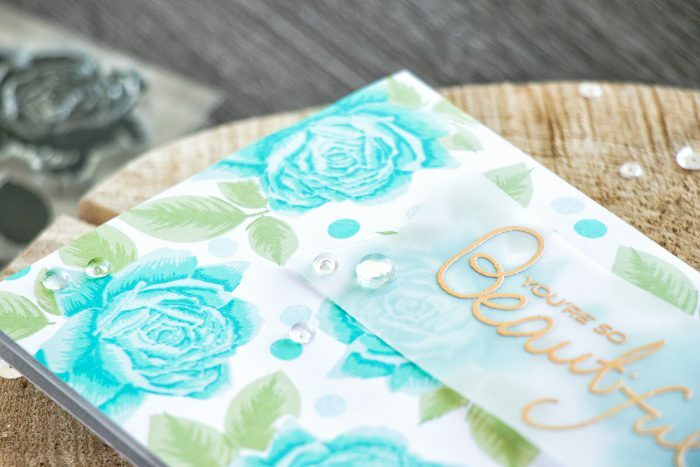 Hello there and thank you for stopping by to celebrate Altenew October Release – there are several new stamp sets that are sure to become favorites of many! There are a few stamp sets in this release that caught my eye and forced a bunch of stamping ideas rush through my head! The first one is Bold Blossoms and it features a beautiful detailed and delicate flower and two leaves. I used this set to create both of the cards I’m sharing today. I stamped flower and leaves outline using Simon’s Intense Black ink onto Neenah Solar White cardstock. For the flowers I used new Rose Petals colors (I skipped the darkest one) and for the leaves I went with traditional greens (I’m linking to all colors below). 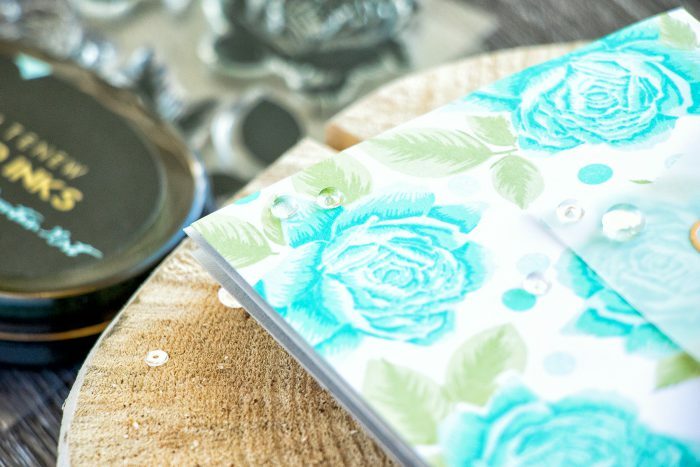 I always strive to have some dimension on my projects, so I cut my images out using scissors and arranged into a floral cluster on a white cardstock banner. The latter was foam mounted onto an A2 top folding card base made out of Woodgrain Powder Cardstock. 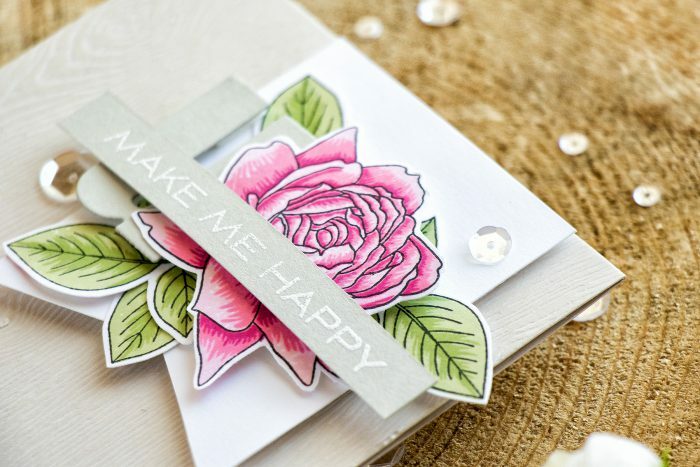 The sentiment, You Make Me Happy came from a different stamp set, Simple Flowers. This is also a new fantastic set that caught my eye. 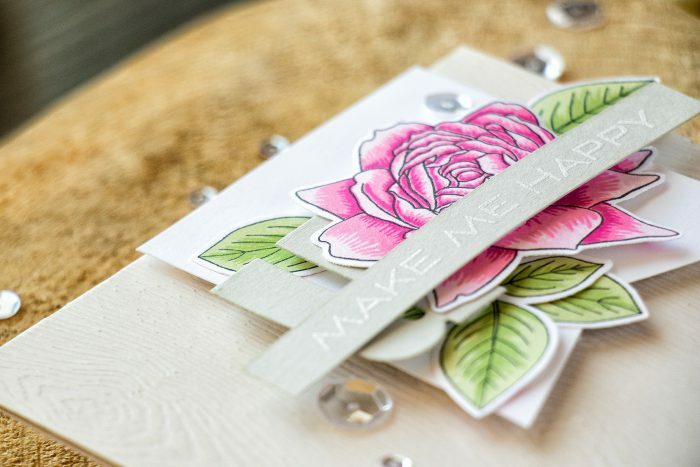 I heat embossed “Make Me Happy” in white embossing powder onto Pale Gray cardstock and added a U letter behind the flower. My second project features the same supplies, but different colors and some additional techniques. Here my background was created by stamping the flower repeatedly. I omitted the outline layer and only used detail and solid layers to stamp the flower and leaves. I love that this set can be used both ways. I had to incorporate masking into this project, but I was able to get away with just one flower mask. I used beautiful teal colors from the Sea Shore ink set (didn’t use the darkest color). 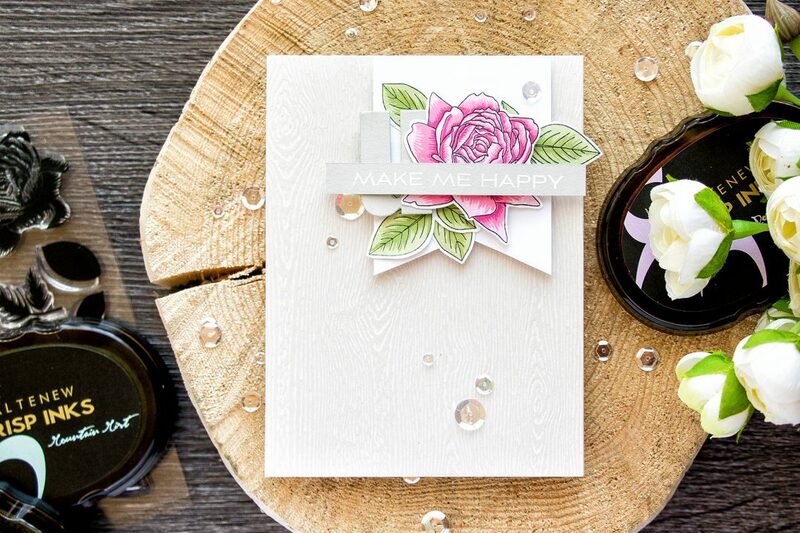 You can also spot a few dots in the background – I stamped those using little solid circles from the Simple Flowers stamp set. My sentiment, You’re So Beautiful, was heat embossed in Simon’s Antique Gold embossing powder onto a layer of vellum. The stamped panel was trimmed slightly and was foam mounted onto a A2 top folding Pale Gray card base. Here’s a quick look at all new products included in Altenew October’16 release. Which one are you most excited about? To celebrate this release, Altenew is giving away a $50 gift certificate to THREE lucky winners! Leave a comment on the Altenew blog by Wednesday, October 19th at 11:59 PM EST for a chance to win. The winners will be announced on Thursday, October 20th on the Altenew blog. You can also win a $30 gift certificate by leaving a comment on my blog! Let me know which new product you are most excited about. I’ll announce the winner on my blog (here in this blog post) by Thursday, October 20th. I’ll e-mail the winner, too. The winner is: Sheri K (please e-mail winner@altenew.com to claim your certificate, my emails are not reaching you for some reason). Thanks! If you arrived from the incredibly talented Lydia Evans, you are on the right track! The next stop on this hop is the one gal who needs no introduction, Jennifer McGuire! If you get lost or would like to start over, please visit Altenew Blog. I am most excited to see the Upper Case Calligraphic letters because I just bought the lower case ones. They are great and I was just wishing for upper case letters. Hopefully, they work together. 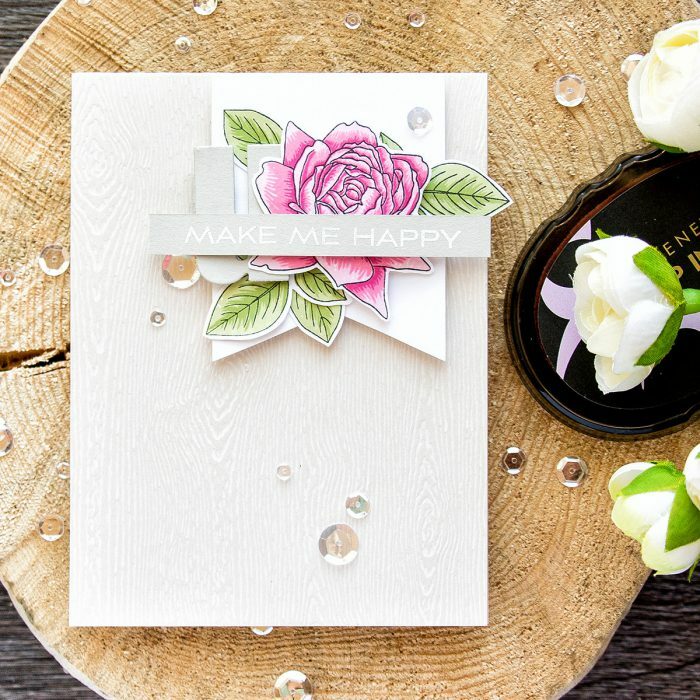 Gorgeous cards, Yana! Love your colour choices and layering. I love the new release! The new inks are beautiful and the stamp sets are gorgeous. The first one on my list is the Simple Flowers. Absolutely adore the retro, graphic feel of the images! Both cards are lovely!! Love the background you have created!! My favorite is the bold blossoms stamp set! What different cards from the same supplier! I love how unique the first card is with the great layering. I always love your work, Yana. Thanks as always for sharing with us and for participating in this great hop and giveaway. Pretty cards. I especially like the dimension of the first. Lovely cards! 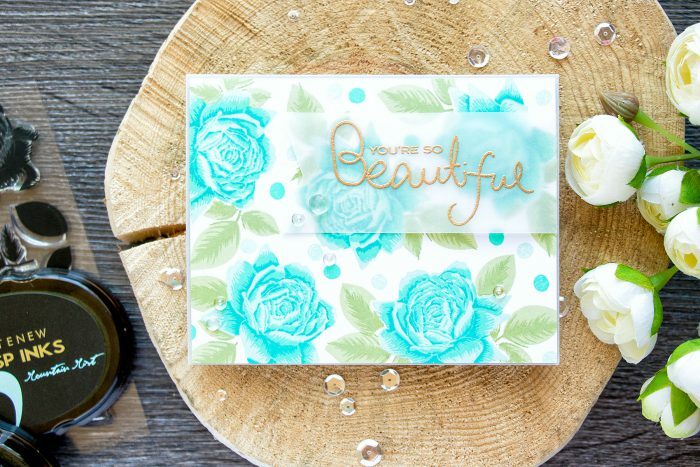 I am still in love with the Bells and Bows set, but the sentiments, Bold Blossoms, and new inks are close behind, especially the aqua set. Oh, my! Gorgeous cards! Love the Bold Blossoms! I love your blue flowers. Gorgeous cards! I like how you can get such different looks by using or omitting the outline! I just love those cursive letter stamps… really difficult not to buy this straight away!